Dili (Agenzia Fides) - "The people of East Timor need real development. People in my country need education and a quality health system, food security that is generated through technical expertise on agriculture, infrastructure, such as transport and roads, electricity and safe drinking water, real estate projects": says lay Catholic Jenito Santana, co-director of the "Kdadalak Sulimutuk Institute" (KSI, "Social Education Institute") in Dili, in an interview with Agenzia Fides. 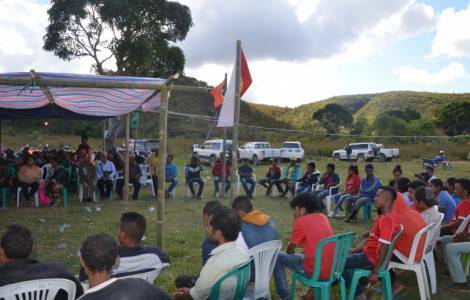 Recently the political instability in East Timor makes it difficult to concentrate on the development of the population: the urgency, therefore, is political stability, so that "a government can meet the real needs of the people", notes Santana. Enhancing agriculture, means of comunication, schools, and health care "would increase everyone's well-being, helping to create a peaceful and harmonious society in which there is a fruitful cooperation of the Catholic Church and the government", he adds. East Timor, which today has 1.2 million inhabitants, became independent in 2002, after a transient administration run by the UN. The population finalized a long struggle for self-determination and independence from Indonesia, which annexed the island when the Portuguese settlers retired in 1975. About 85% of the population relies on farming for sustenance. Rice is the most widespread cultivation. The unemployment rate in the agricultural sector is high. KSI is a civil society organization that works with farmers' associations and promotes sustainable development, in partnership with public institutions and with the Catholic Church. The Institute focuses on three dimensions: ecological, economic and social sustainability, with the overall goal of building a society where everyone lives in social equality, peace, solidarity and respect for the environment. With regards to the instruments, the Institute promotes fair trade, small loans, savings groups, collective organization, cooperatives and networks, regional and national, to influence policy makers. Among the most important challenges today, there are controversies over land ownership and exploitation. For example, the government intends to give land in the district of Ermera - known for its coffee cultivation - loaned to multinationals, threatening the livelihood of small peasants.